New Orleans, La. – This upcoming October 16, will be the 19th anniversary of the Historic Million Man March. Fueled by desire to keep the spirit of the Historic Million Man March alive and restoring the hope in the redemption of the Black community in New Orleans, Brother Student Minister, Willie Muhammad reached out to other community activists to assist. 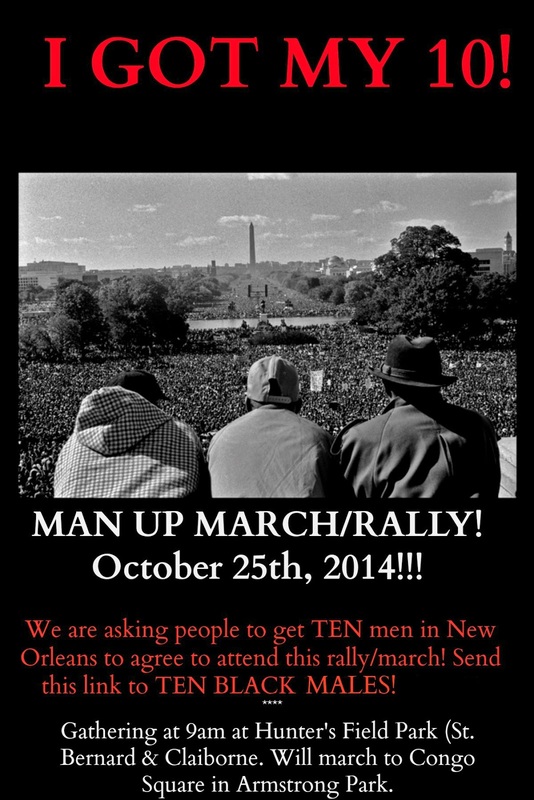 The committee is calling for 1000 plus Black men to gather on October 25, 2014 at 9am at the Hunter’s Field playground in New Orleans. From there the men will walk down an avenue that runs straight through the heart of one of New Orleans historic Black neighborhoods to participate in a rally at the Congo Square which is located in Armstrong Park. Once at the park, the rally will begin. “At this rally we have developed a program around a principle that was articulated during the speech of the Honorable Louis Farrakhan when in D.C. The Minister asked those in attendance to join on to any organization that was working to better our people. Well, we have selected eight categories that impact the Black community here in New Orleans. Those categories are health, violence reduction, youth development, economic development, political involvement, arts & culture, prison reform and education. We will have a panel select eight organizations that have a track record of successfully working in these areas. At that rally we will ask those among the one thousand plus to join those groups or find some kind of way to help them in their work. After the march we will give a report on how many agreed to do so and we will monitor their progress throughout the year,” stated Brother Willie Muhammad. 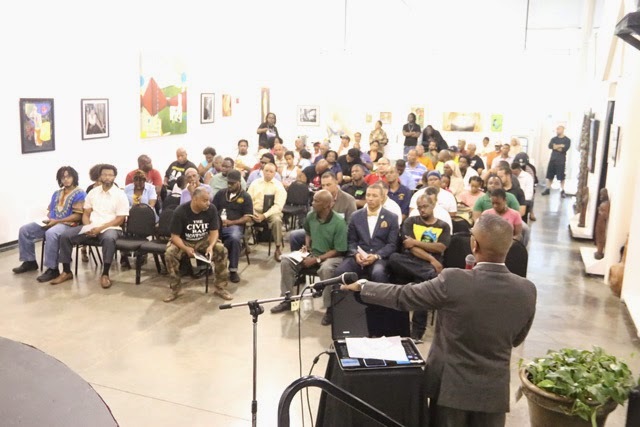 On August 9, the committee held a community meeting titled, “The First 100!” At this meeting 100 influential people within the Black community in New Orleans were invited. They viewed a power point presentation outlining the overall idea and goals of the march/rally. They were then asked if they would be willing to support by showing up themselves on Oct. 25 and actively recruiting ten Black males to do the same. In addition to that those in attendance were asked to help setup meetings with members of the local organizing committee and organizations, churches and groups they belonged to. The meeting was a success, the room was filled and everyone was excited about the upcoming march/rally. “Our community is a wheel, and our people are the spokes in it. Through the process of Truing, each one of us must adjust the tension of our respective spokes in order for our community to have the quality ride it deserves and once that wheel makes a complete turn, it is at such time we will have revolution,” said Brother Shack, of the True Love Movement, when asked about the success of the August 9th meeting. Brother Shack is also one of the march/rally organizers. During the first phase of promotion the organizers used social media to inform people about the upcoming march/rally. A Facebook page titled, “Man Up March: A Call to Action" has been created. Thus far the reception has been very good. Brothers have begun posing the phrase, “I have my ten,” in reference to ten males they have encouraged to attend and sisters have been posting remarks showing their support as well. The energy is building as the march nears. “This march will be the defining moment for black men in this city. This is the time and this is what must be done, for our wives, our children, our community and indeed for our very existence,” stated Brother Asad, a local entrepreneur who is part of the local organizing committee.